FILE - Turkey's Foreign Minister Mevlut Cavusoglu, right, shakes hands with U.S. Secretary of State Rex Tillerson after a joint news conference following their meeting in Ankara, Turkey, Feb. 16, 2018. The dismissal of U.S. Secretary of State Rex Tillerson is threatening to further complicate efforts to resolve a crisis involving key NATO ally, Turkey. Turkish Foreign Minister Mevlut Cavusoglu warned that Tillerson's firing likely would delay a meeting scheduled for Monday between the two diplomats. Cavusoglu had earlier described the Monday meeting as key to resolving ongoing differences between the countries over Washington's support of the Syrian Kurdish militia, the YPG, in its war against the Islamic State. Ankara considers the militia terrorists linked to a Kurdish insurgency inside Turkey. 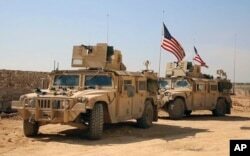 The dispute has poisoned relations between NATO allies, potentially spilling over into direct confrontation with Ankara, who is threatening to attack the YPG in the Syrian City of Manbij, where U.S. forces are deployed with the Kurdish militia. Turkish President Recep Tayyip Erdogan meets U.S. Secretary of State Rex Tillerson in Ankara, Turkey, Feb. 15, 2018. Analysts claim Tillerson worked hard to pull the countries from the brink, including a three-and-a-half-hour meeting with Turkish President Recep Tayyip Erdogan and Cavusoglu in January. "We worked with Tillerson at a point in which our ties came to a critical stage," Cavusoglu said Wednesday. "We continued our communication even in the most difficult times." Turkish and U.S. officials are currently engaged in a series of meetings to resolve ongoing differences. "In the first instance, Ankara, and especially foreign minister Cavusoglu, is losing an interlocutor that he appears to be getting along with quite amicably," said political columnist Semih Idiz of the Al Monitor website. "The choice of Mike Pompeo is being questioned in Ankara." U.S. President Donald Trump has named Pompeo, the former CIA chief, as Tillerson's replacement at the State Department. In a tweet the day after the failed coup in Turkey in 2016, Pompeo referred to Erdogan as heading a totalitarian Islamist dictatorship. FILE - Then-CIA Director Mike Pompeo speaks during the Foundation for Defense of Democracies National Security Summit in Washington, Oct. 19, 2017. Turkish Prime Minister Binali Yildirim sought to play down the nomination of Pompeo, who still has to be confirmed by Congress. "Whoever comes in, Turkey's stance is clear. It is not very important to us what the new secretary thinks about Turkey," Yıldırım said. Analysts point out that Ankara is likely to be more concerned with Pompeo's stance toward the YPG. "Pompeo may take a harder line. He may be closer to the Pentagon's position of supporting the YPG and that they will defend the YPG against any attacks from anybody, which includes Turkey," Idiz said. "So, there is this concern in Ankara that Pompeo will be more aligned to the military outlook than the diplomatic." Turkish presidential and diplomatic sources frequently blame the Pentagon's strong support for the YPG as the root of many problems in bilateral relations. But other observers suggest the outcome of future Turkish-U.S. relations will ultimately depend on the diplomatic goals of the new secretary of state. "Pompeo has a military background. He is a person more likely to play hardball than Mr. Tillerson. If that is used for Turkey's interest, is one thing. If it's used against Turkey, is something else," said former senior Turkish diplomat Aydin Selcen, who served in Iraq and Washington. "The difference will be what the priorities of the U.S. [are], and whether they can accommodate Turkey, is the question. Whether there will be real friction between the U.S. and Iran in our region?" Selcen added. 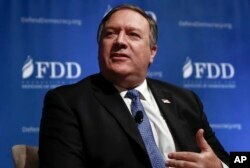 Pompeo is widely seen as a hawk toward Iran, a stance Trump indicated as a factor behind nominating him. A tougher stance toward Tehran could become a powerful impetus to Washington improving relations with Ankara. "The United States needs Turkey, given what the United States wishes to accomplish in the region. Primarily, how are you going to contain Iran in the region?" asked Soil Ozel, international relations expert at Istanbul's Kadir Has University. Turkey is one of Iran's main trading partners, and it borders both Syria and Iraq. Tehran is seeking to expand its influence. Such a strategic location is why analysts suggest Ankara would be key in reining in Iran's influence. But Pompeo may not find a willing partner in Ankara for any new aggressive policy toward Tehran. "I think Ankara ... will want now to maintain its own specific relations with Iran, even if America pressures it to take a specific position on Iran," Idiz said. "Remember in the past, it [Ankara] has very rarely fallen in line with the West on Iran, especially on sanctions." Analysts point out a stark reminder of Ankara's independent stance toward Tehran: the January conviction by a New York Court of a senior Turkish banking official of evading U.S. sanctions against Iran, among other offenses. Prosecutors implicated former Turkish ministers closely linked to Erdogan. The case is another point of contention in bilateral relations that Ankara claims is politically motivated.